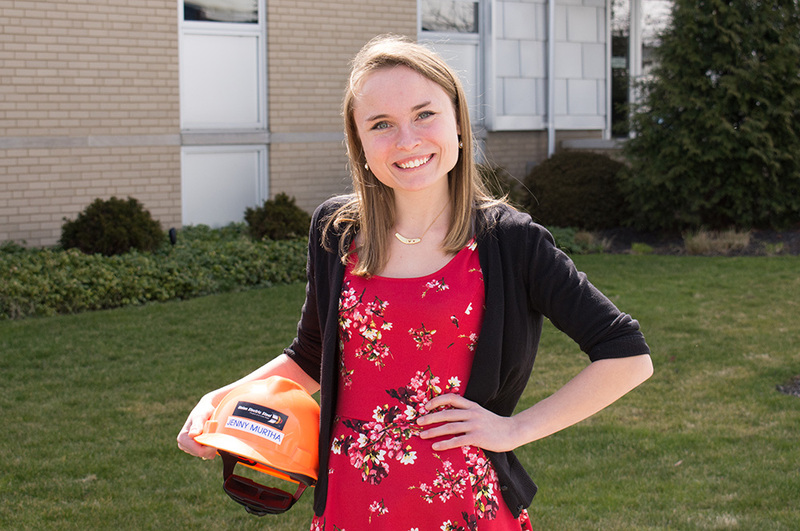 "Jenny Murtha was selected for the HR internship because of her passionate interest in human resources and her willingness to learn and step outside of her comfort zone. I believe that Point Park University, through its curriculum, has cultivated Jenny to apply knowledge from all of her courses to this business and life experience." "My HR management classes have helped me to learn how to properly research resolutions to issues that may arise in the workplace. They have taught me many different laws and regulations that HR professionals must abide by as well as how to be a well-informed, ethical leader." Tell us about your HR internship with Ampco-Pittsburgh Corporation. I've been at my internship with Ampco-Pittsburgh for almost a year now and have been so fortunate to be involved in so many projects. I am so lucky to have gained exposure into many different aspects of the vast and ever-changing field of human resources. I've had the opportunity to phone screen, interview and offer applicants jobs as well as conduct new hire orientations. Additionally, I have been involved in the updating and distribution of key corporate policies and have assisted with various government compliance projects such as EEO-1 Reporting, Affirmative Action Plan Reporting and Dodd-Frank Reporting. Also, I have been able to work within two different HRIS systems. At Ampco, they truly make me feel that I am part of the HR team by involving me in staff meetings and trainings. Point Park University offered me a great scholarship and it was close to home. I knew I wanted to commute and Point Park does a wonderful job of being a commuter-friendly school. How have your HR management classes helped you in this internship? My HR management classes have helped me to learn how to properly research resolutions to issues that may arise in the workplace. They have taught me many different laws and regulations that HR professionals must abide by as well as how to be a well-informed, ethical leader. After graduation I would love to become an HR generalist. From there, I plan on studying for my CPHR certification and going on for my M.B.A. I would then love to become an HR manager and keep moving up the corporate ladder. I encourage all students to try to land an internship. Internships truly help you to see why what you are learning in class is valid and important. They also allow you to gain exposure to your industry before graduation, which looks great on a resume! I would like to thank several professors who I feel go above and beyond their duties including Sandra Mervosh, Wayne Grim, Dan Mitchell, Abby Mendelson, Dan Fitzhenry and David Diehl. All of these professors care about students more than just when they are in the classroom. I have seen each of them connect with their students and offer them guidance and advice on a personal and professional level. They all go out of their way to make sure students understand the material given, which from personal experience is very much appreciated!